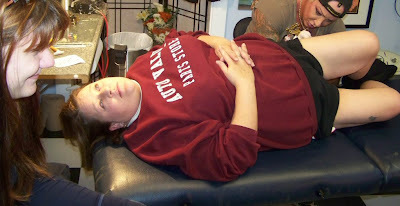 Just look at what some of our members will do to raise Congenital Diaphragmatic Hernia Awareness!! 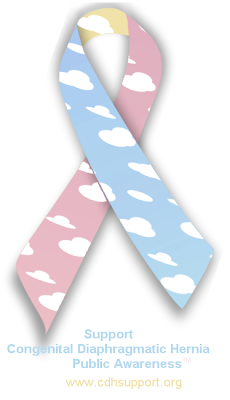 We have some members at CHERUBS who raise Congenital Diaphragmatic Hernia Awareness ALL the time! 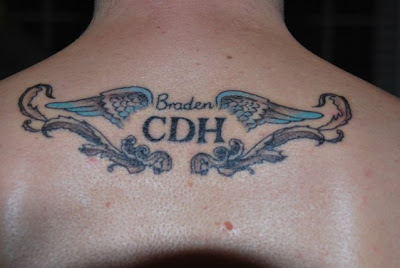 🙂 These brave and amazing moms and dads have gotten tattoos of our Congenital Diaphragmatic Hernia Ribbon and other logos! 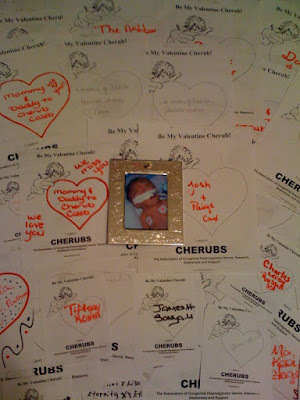 This year, several of our members convinced their local stores to sell Valentine’s Day posters in honor / memory of their cherubs to raise money for CHERUBS. 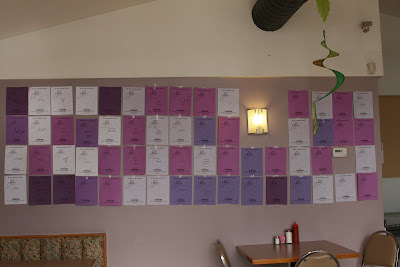 Below are photos from just a few of these fundraisers! The photos below are fundraisers in memory of Caleb Cox and in honor of Logan Wagner. The best thing about this fundraiser is they raised TONS of Congenital Diaphragmatic Hernia Awareness!!!! Along with the “valentines” displayed were posters explaining what CDH is! Thank you to all the families, friends and establishments that made our first annual CHERUBS Valentine’s Day Fundraiser a success!!! This video is from our local NC news channel. It’s quite inspirational to everyone, but especially to families who are dealing with medically fragile children such as our children born with Congenital Diaphragmatic Hernia. This is a wonderful example of why our organization is named CHERUBS. For the baby angels that these children are. Miracles can happen with angels and cherubs. So many of our families have witnessed miracles. Miracles do exist. This years holiday truffle sale went very well! We sold boxes and platters of truffles in a variety of flavors including banana, coconut, orange creamsicle, peanut butter, mocha, double chocolate, raspberry, key lime, and Andes mint. We sold over 2200 truffles this year to raise money for the Gabriel’s Gift Bag project. Thanks to everyone who helped us sell them, we raised enough money to fill 50 bags! Every year since 1997 CHERUBS members have participated in National Children’s Memorial Day. This was started by Compassionate Friends in remembrance of all children lost. This includes children of all ages, including those not yet born, and includes children lost from all diseases, birth defects, accidents, murders, suicides – ALL children. Because we have several cherubs who were lost over 1 yr old, the Pregnancy and Infant Loss Day didn’t encompass all of our cherubs – National Children’s Memorial Day does. It also allow grieving parents to meet with other local grieving parents in their areas. This event occurs every year on the 2nd Sunday of December and proclamations by the Senate and President are signed. Proclamations are also signed by other heads of state around the world. Each year, most of our grieving families light candles at 7:00 pm – with each time zone this creates a continuous light around the world for 24 hours. Many of us light candles for our cherubs and for other cherubs as well. I invite ALL members to participate this year. This includes those of you who still have your cherubs – please light a candle for those cherubs lost, in honor of your miracle and blessing of still having your cherub here. Some of you may know, I have had many miscarriages. I light candles for those babies as well and light candles for many cherubs. I started doing this in 1997 and in 1999 I had to add a candle for Shane. That first year his candle (a tealight) caught my coffee table on fire. 20-something candles on the table for my babies and many cherubs and his somehow got the polyurethane so hot that it burnt a hole in my antique table. I still used that table until last month when I got married and didn’t have room for it – I smiled every time I saw that burn mark – like Shane was sending me a sign that he was there. Because the 2 years before, he had been, watching the flames on the candles as his dad and I said prayers for the children lost. And saying prayers for how thankful we were to have him still here. This is why I ask of all you to participate – in joy for our cherubs still here and in memory for those who are not. Some other things we can do to also raise awareness…. wear CDH Awareness clothing. 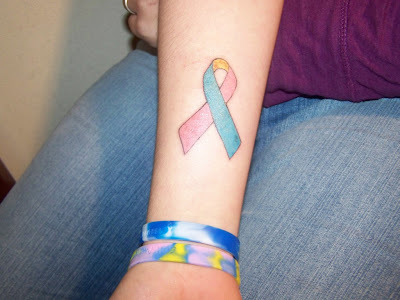 It doesn’t matter what group it’s from, what color the ribbon is… just raise awareness. Our Texas members had group candle lighting ceremonies for 2 years. I help a group candle lighting in NC for all local grieving parents (not just CDH) one year. Churches will often include information in their services and programs if you ask. Many churches will let you hold candle lighting ceremonies as well. During the day you could organize a balloon release with the children’s names on the balloons (florists will often donate them). Local newspapers usually welcome stories on NCMD and the events held locally. This is a great way to raise awareness of NCMD and CDH. Or you can just gather your family in your home and light candles and say prayers at 7:00. The week before NCMD, our site will change to black and white and there will be a listing of all the 100’s of babies lost to CDH on our homepage, with a candle by each of their names (make sure you check the box to give publishing permission on your Profile so your cherub is included if your cherub has wings). This will stay up for 1 week and it will be a very solemn reminder of just how many cherubs are lost – scrolling and scrolling through a list of names of victims to CDH is heartbreaking when you think of all the families of all these children. We do this out of respect for our grieving families, those who will not get to buy toys for their cherubs this Christmas or watch them build snowmen or celebrate New Year’s. The point of all we are doing for NCMD, of all of this, is let us all participate this year and remember why we are all here – to help CDH families and to try to stop the loss of more babies to CDH. If you would like to hold a local event, please let us know. Donate to CHERUBS for free just by shopping in over 700 stores through goodshop.com! If you shop on-line, please consider shopping through Goodsearch.com for CHERUBS. As you know, CHERUBS is a non-profit organization and as you can imagine nonprofits and schools are facing a fundraising crisis this year. The good news is that more than 700 of the top Internet retailers and travel sites including Amazon, eBay, Target, Apple, Expedia and more have joined forces with GoodShop.com to donate part of every purchase to your favorite charity or school at no additional cost to you (more than 64,000 nonprofits are now on-board)! It takes just a few seconds to go to http://www.goodshop.com, select your charity, and then click through to your favorite store and shop as usual. Also, Yahoo has teamed up with GoodShop’s sister site, GoodSearch.com, to donate a penny to your cause every time you search the web. This is totally free as the money comes from advertisers. To give you a sense of how the money can add up, the ASPCA has already earned more than $17,000! Please tell 10 friends about GoodShop and GoodSearch today. They’ve been featured in the NY Times, the Wall Street Journal, CNN, Oprah Magazine and more. Charities need our help to spread the word now more than ever! Donate to CHERUBS for free just by shopping in over 700 stores through goodshop.com! CHERUBS name was one that was easy to decide on. Baby angels…. named for all the children lost to CDH. Not cherub, as in one child, but cherubs for ALL the children born with CDH. My son was still alive when CHERUBS was created, it was named for Preston and Andrea – the 2 other CDH babies in the hospital that year that didn’t survive. CHERUBS was founded to be a support organization, not a foundation, so it was very important to have a name that included all of our children. CHERUBS was an original name. 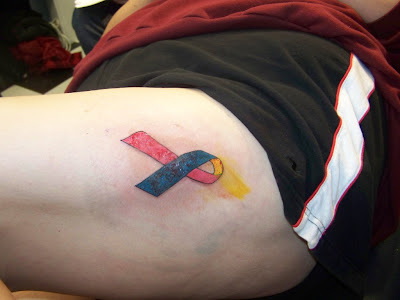 At the time there were no other organizations with the same name that dealt with birth defects. We were very insistent on not following others foots steps or riding on other’s coattails…. we wanted to be independent and this made it harder for us to pave our own way but we are proud that we did. CHERUBS wouldn’t be who we are if we were to use a name or slogan similar to anyone else. 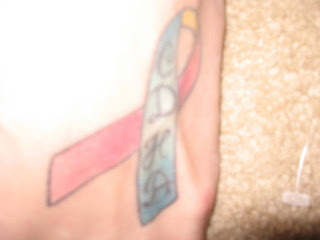 50% of children diagnosed with CDH still do not survive. This takes into account ALL babies diagnosed – not just those whose parents chose to continue with the pregnancy and those babies that survived transport to larger medical centers. This statistic includes those who are stillborn, those that are miscarried, terminated, or die before care can be given. This statistic includes those who live minutes, hours, days, weeks, months or years but who pass away from CDH or related CDH issues. 50%. Of the 1600 babies born with CDH each year, 800 will not survive. The cause is still not known. 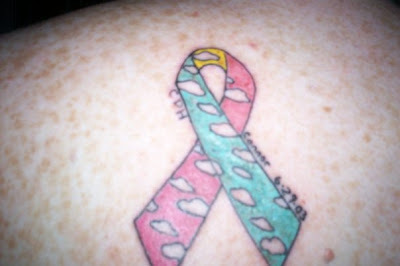 CHERUBS is named for them… for all CDH babies, survivors and non-survivors – with or without wings. Cherubs…. baby angels. Miraculous children. Children with wings and halos and hope. Our logo reflects that…. a group of child angels. Supporting each other. Older survivors. Newborns. Our colors are all colors of the rainbow…. pastels and bright colors. No trendy logo colors. No logo dedicated to one child or a symbol of one child. All colors, all ages, all children, all CDH families represented. The word CHERUBS is in a font that is reminiscent of balloons… both for celebrating life and for those who didn’t survive (as grieving parents often send balloons to heaven for our children). We added logos to include medical professionals. We added fundraising event logos. And logos for our Congenital Diaphragmatic Hernia conferences. We even added holiday logos. These cherubs represent our real life cherubs, with over 100 different logo characters. 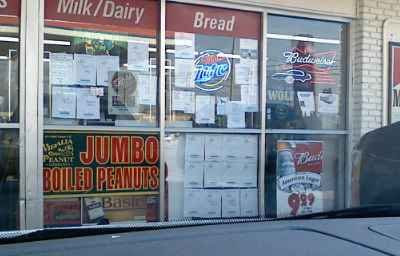 These images and logos have been seen around the world. On shirts worn by our members in 38 countries. At conferences. In magazines. In newspapers. On television. On 1000’s of web sites. The word “cherubs” has become synonimous with CDH kids. CDH kids have even been called “cherubs” in the media, in the printed materials of hospitals, and even at medical conferences. 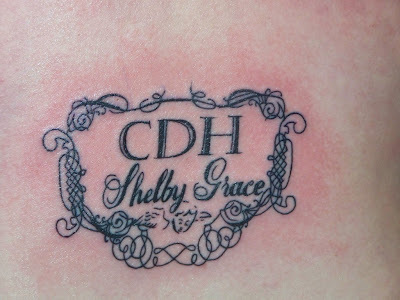 If there was ever a “branding” of a corporate name with CDH, it has become “cherubs”. And it suits. Because they are all little angels…… cherubs.